The guard that nobody wanted became the guard that everyone wanted. College football scouts said that Maurice Herbert Furchgott, at 155 pounds, was too small to play major college football. The guard they all wanted was the other guard at Atlanta Boys’ High School, Charley Furchgott, Maurice’s 185-pound brother. Charley had 17 scholarship offers; Maurice, none. Although Charley signed and had a stellar career with the Georgia Bulldogs, it was “mammoth” Maurice, now up to 165, who attracted national attention as a walk-on at Georgia Tech. In 1944, he was not only a starter, but a unanimous All-Southeastern Confer-ence pick and a selection on two All-American teams. 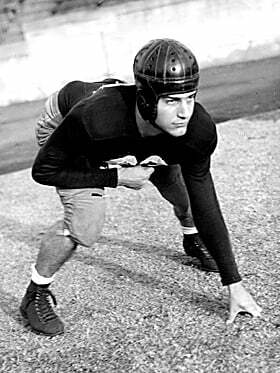 Maurice’s blocking, tackling, speed and maneuverability helped lead coach Bill Alexander’s Jackets (the late Bobby Dodd was then Tech backfield coach) to back-to-back (1943 and ‘44) Sugar Bowl and Orange Bowls. In 1943, Tech won the Sugar Bowl game, defeating Tulsa and its great quarterback, Glenn Dobb, 20-18; the team lost the ‘44 Orange Bowl to Tulsa, 26-12. In 1943, Georgia Tech finished the regular season with a record of 8-3-0, (3-0 in the SEC) and won the SEC championship, due in no small part due to Furch-gott. In 1944, Furchgott’s senior season, Tech repeated as SEC champion with an 8-3 won-lost record (4-0 in the SEC). No one who saw the Tech-Navy game in 1944 will ever forget the performance of 165-pound Furch-gott, who pushed and shoved and blocked and held up 245-pound two-time All-American tackle Don Whitmire. In six previous games, no one had dared to run against Whitmire. Furchgott was the most incredible player in what was the most incredible football game ever played on Grant Field, before or since. Navy out-weighed, out-gained, out-rushed, out-passed, out first-downed and completely out-played Tech all over Grant Field. But the final score was Navy 15, Georgia Tech 17, thanks to a late Dinky Bowen field goal with kick protection by Furchgott. Furchgott was just as notable on campus as he was on the gridiron. He was president of his freshman class, secretary of his sophomore class, treasurer of the Interfraternity Council, superior of the Phi Epsilon Pi fraternity, a member of Omricon Delta Kappa, Phi Beta Sigma and the Institute of Aeronautical Science club. He held the rank of lieutenant in the Naval ROTC and was voted into the ANAK Society, the highest honor attainable on the Tech campus. Upon graduation he was commissioned as an ensign, and he spent the next three and a half years on active duty. He was an engineering instructor at the Naval Academy prep school at Bainbridge, Md., and served on the aircraft carrier Coral Sea during the Korean War. He retired with the rank of lieutenant commander. When he was not on active duty, he taught math at Georgia Tech. He spent 24 years in the U. S. Naval Reserve. Today, Maurice Furchgott is 87 years old. He lives in Baltimore, where he owns and operates a nationwide sales promotion company. Two days a week he plays tennis, and two days a week he plays golf. He works out with weights four times a week and looks fit enough to play college football today. Community-wise, he is vice-president of a regional theater group and is its No. 1 fund-raiser. He recently spearheaded a drive that raised $17.5 million for a new theater. With all that he does in business and in the community, he still finds time to enjoy cruises. He and his wife completed a 71-day cruise around the world not long ago. He telephoned the office every day. Maurice and his first wife, Marilyn Rosolio of Thomasville, were married 26 years; she died in 1977. They had one son, Roy. Eight years ago Maurice married Debra Sher of Baltimore. Charles Furchgott, who is now deceased, may have been the biggest football star at old Atlanta Boys’ High School and one of the greats at the University of Georgia, but pound for pound his brother, Maurice, the guard nobody wanted, will long be remembered at Georgia Tech.